Cruise Tips First Time Cruisers Are You Ready to Take a Cruise? Ask Yourself These 7 Questions! Maybe you’ve been dreaming of somewhere tropical and warm. Maybe you want to experience the old-world beauty of Europe. Or maybe you want to see the wilderness of Alaska. A cruise allows you to see the world, no matter what vacation floats your boat. Of course, you have to make sure you’re actually ready to take a cruise. Here are seven questions to help you find out whether a cruise is the right vacation for you. 1. Do You Like a Set Itinerary? The first thing any new cruiser should ask is whether they like a set itinerary and schedule for their vacations. Cruises are unlike other vacations in that you’re not entirely free to follow your own whims. You’re literally on a boat, so the places you go, when you go, and how long you stay are dependent on the crew. You can certainly create some structure within individual days, and there are definitely things you should try on your first day, but you don’t get to decide how long you stay at a port (unless you plan on being left behind). 2. Do You Like Being Around People? Another question you need to answer is whether you like being around a lot of people. Emphasis on a lot. The average cruise ship can hold a few thousand people. Bigger cruise ships can hold around 4,000. There are smaller expedition trips, especially river cruises, that can hold 80 to 160 travelers. Either way, it’s still a lot of people. More importantly, you’re all boxed in on a boat, so there’s not really anywhere you can go to get away from the crowds (except your cabin or the bathroom, obviously). If that sounds like your worst claustrophobic nightmare, you may want to investigate other vacation options. 3. Are You Overwhelmed by a Lot of Choices? The best quality of cruises is that they offer you a ton of options. On the flip side, the worst quality of cruises is that they offer you a ton of options. Cruise ships are designed to keep a few thousand people with their own unique tastes occupied for an extended period of time. That means you could spend every hour awake on the ship and only scratch the surface of the available options. On board, you have things like trivia, movies, live music, games, dance parties, and more. There are also wellness options, like a spa, a fitness center, and a pool to relax by. That’s not counting everything you can do at a port, even if you’re only there for a narrow window of time. Some people love staying busy every day. Others would find such a plethora of choices completely overwhelming. Next, you should take a look at your budget. Much like hotels, cruises offer a wide variety of price points with associated options. An old rule of thumb said you should budget at least $100 per person per day, which is still a reasonable minimum. Keep in mind, though, that many things that used to be included in “all-inclusive” cruise fare are no longer included. Shore excursions, for example, will cost extra, as will alcoholic beverages during the day, eating at one of the ship’s fancier restaurants, and tips. There are no maximums in terms of what you could spend, so it’s best to know what you are willing/able to spend during your vacation. That will give you a sense of whether you can afford a cruise. Part of figuring out your cruise budget is figuring out who’s going on the trip with you. The specific vacationers will also change the type of cruise you take. All age groups are welcome on a cruise, and anyone can find something to entertain themselves on a cruise ship. The bigger question is what combination of people you’re dealing with. Are you bringing your spouse for a honeymoon cruise? Are you bringing your spouse and the kids for a family vacation? Are you traveling with friends? Are the adults in the family taking a break from the kids? Each group will want different things from a cruise, so it’s important to find a vacation option that suits everyone’s tastes. 6. What’s Your Cruise Personality? This feeds into our next question: what’s your cruise personality? Much like people or hotels, every cruise line has its own personality. Celebrity, for example, draws a quieter, style-conscious crowd, while Carnival is known for being more fun-loving and gregarious. Both ships take similar routes and offer comparable prices and amenities. But the average Celebrity customer would be miserable on a Carnival trip and vice versa. With that in mind, do your homework on cruise lines, and be real with yourself about your vacation style. 7. How Long, and When, Do You Want to Travel? Finally, ask yourself when you want to travel and for how long. Cruise pricing is very much subject to supply and demand. Cruises tend to be a bit cheaper in the spring or fall when kids are in school and the weather is uncertain. In addition, some areas have short cruising seasons, like Alaska or northern Europe. 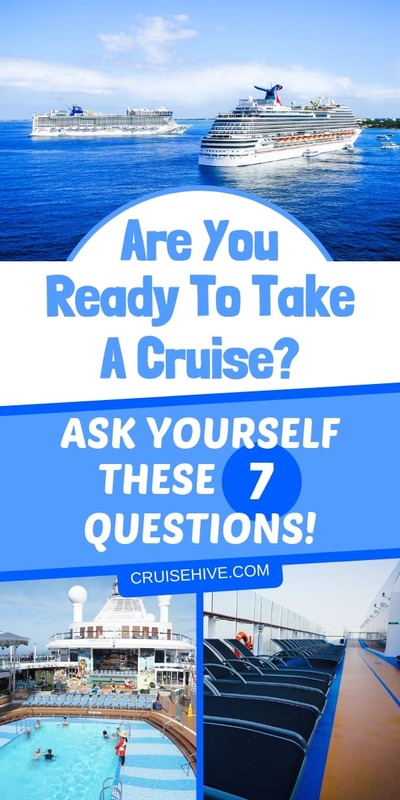 The second half of the question is how long you want to travel, as this will change your budget and what cruise you’re after (and the price of the cruise, depending on when you go). If you have less than a week, you’re likely restricted to the Bahamas, Mexico, the Carribean, or a “cruise to nowhere”, in which the boat takes passengers out to sea for a long weekend before returning. Ready to Take a Cruise? Having asked all those questions, are you ready to take a cruise for the first time? If so, we’re here to help you find the best trip for you. Click here to check out our available cruise deals, or book a cruise if you’re ready to take the plunge.